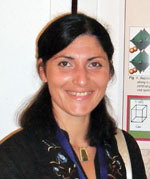 Dr. Ljiljana Veselinović (née Kandić), BS Geol. Ljiljana Veselinović was born on December 23, 1975 in Smederevo. She graduated from the Faculty of Mining and Geology in Belgrade, Department of Mineralogy and Crystallography in 2002 (Diploma Thesis title: "Quantitative X-ray Analysis of Magnetite, Hematite and Fluorite Mixtures using the Rietveld Method". She enrolled postgraduate studies at the same faculty in 2003 (Department of Crystallography). In 2010, she defended her MSc thesis titled XRD analysis of nanostructured calcium phosphate powders obtained using novel synthesis routes. In 2016, she defended her PhD thesis entitled Crystal structure and electrical properties of BaTi1-xSnxO3 and CaCu3Ti4-xRuxO12 perovskites materialas. Ljiljana Veselinović nas been working at the Institute since 2005.